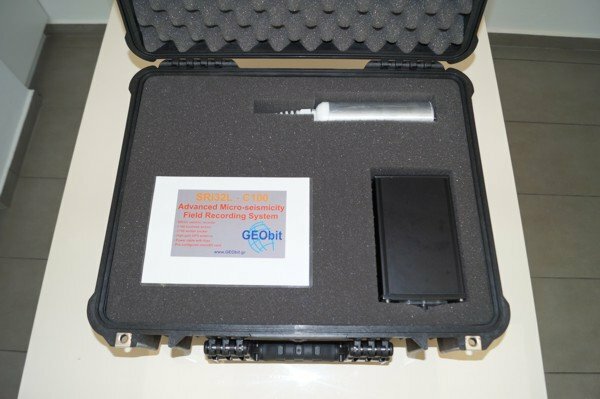 GEObit provides compact solutions for quick deploy seismic stations based on SRi32L digitizer/recorder and C100 sensor. The SRi32L recorder has 3 input channels, and integrated sensor electronics. The digitizer is based on a powerful, wide dynamic range 32bit delta-sigma analog-to-digital converter, with very low noise characteristics and excellent power supply rejection. The sampling rate can be set to 50, 100, 200, 250, 500 and 1000 samples per second. The sensor response is 10sec – 98Hz. The data are stored into removable microSD card. Ultra low power consumption allows over one month of operation if getting powered from an ordinary 12V/65Ah lead-acid battery. The LCD display, displays the State-of-Health, time and date and other information related to the instrument’s operation. The digitizer is intended for installation in harsh environments. The instrument supports embedded SEEDlink server for real time data telemetry. Here we present the instrumentation which have been used in several passive tomography projects as well as several micro-seismicity and induced seismicity projects, and explain why we propose the use of this kind of equipment. So why chose a GEObit unit? 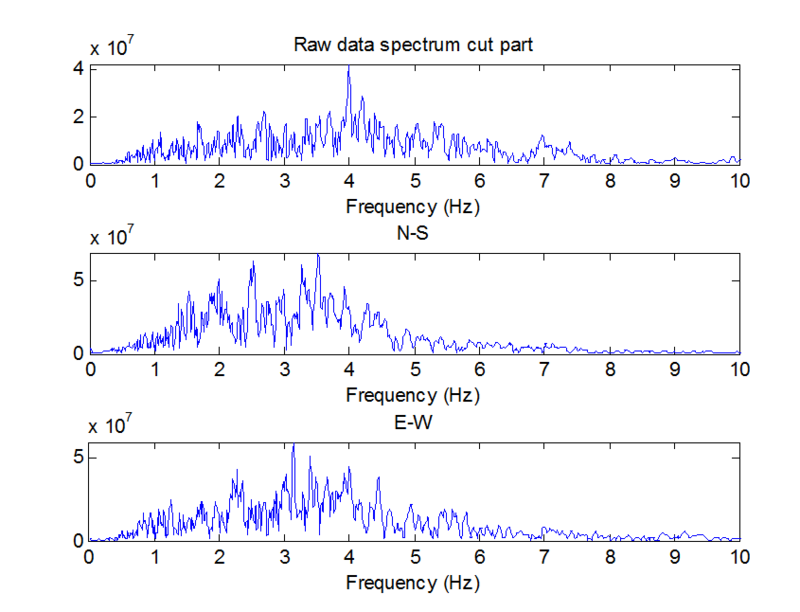 At micro-seismicity monitoring experiments and applications the seismic events usually have a magnitude from –2R, up to 4R, and their frequency spectrum is into the band 0.8Hz to 20Hz. So, a wide band seismometer with the range of at least 0.5Hz(2 sec) up to 30 Hz is necessary to be used for the recording of such seismic events. 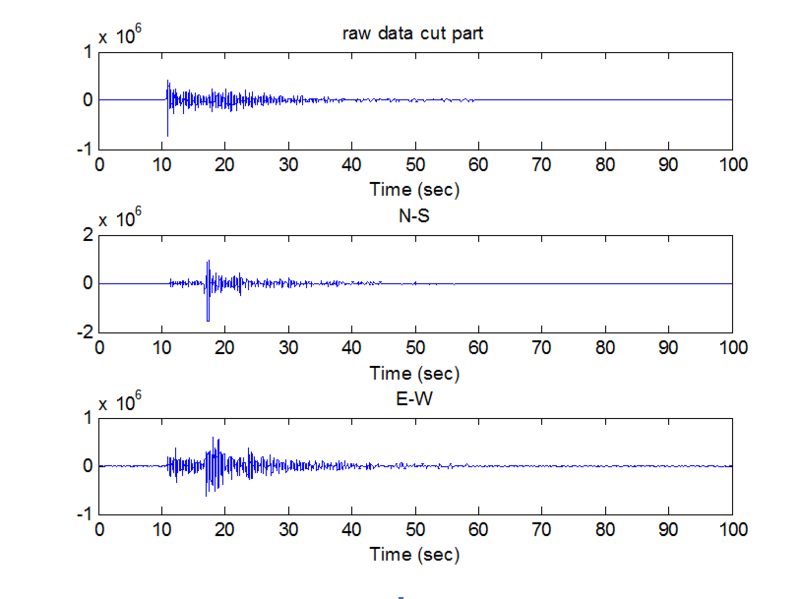 In micro-seismicity monitoring , we are using sensors with recording bandwidth from 0.1Hz to 100Hz in order to record the seismic events with the maximum quality. 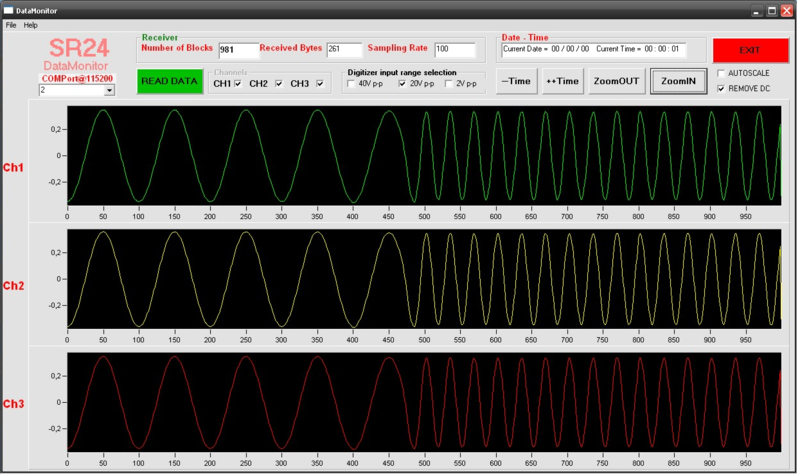 The low frequency response gives us the ability to calculate moment tensors as well. Somebody may ask, why not broadband sensors? The answer is that the broadband sensors are much more expensive than our sensors and makes the survey inefficient in price terms. We do not get more information using broad-band sensors of local micro-earthquakes recording. At the next experiment we used wide band and broad-band sensors at the seismic network. 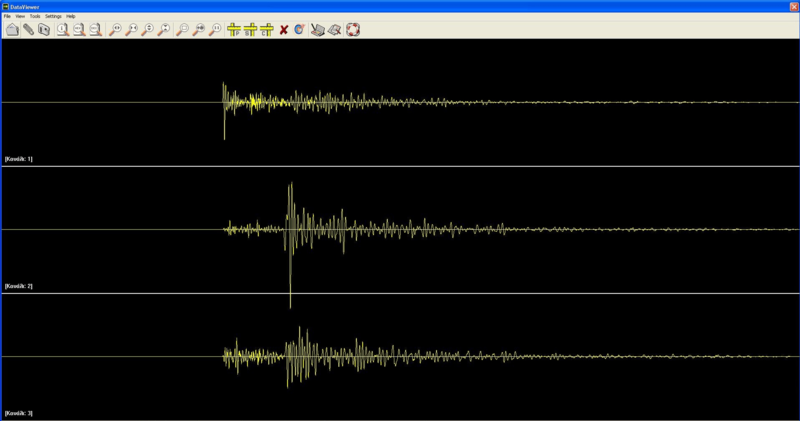 Here is an example of a recorded earthquake. The figure 4 shows a typical seismic event recorded from a wide-band and eight broad-band (Nanometrics – Trillium 40T) sensors. 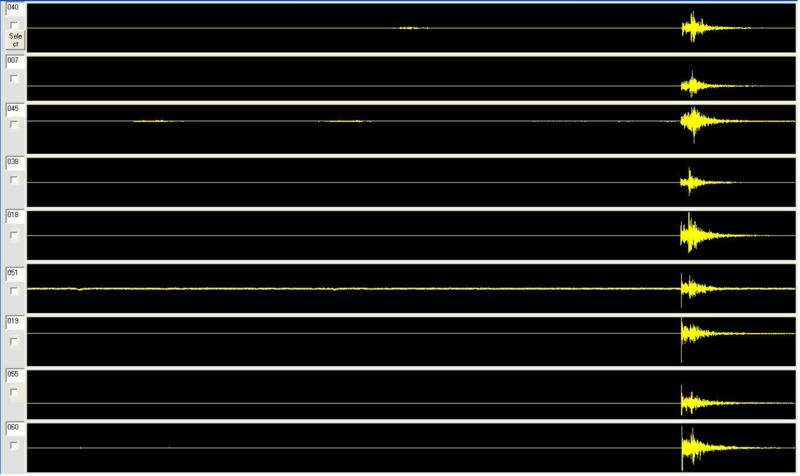 Trace 19 is the broad-band one and it could not be recognized from others having a first look at the signal plot. 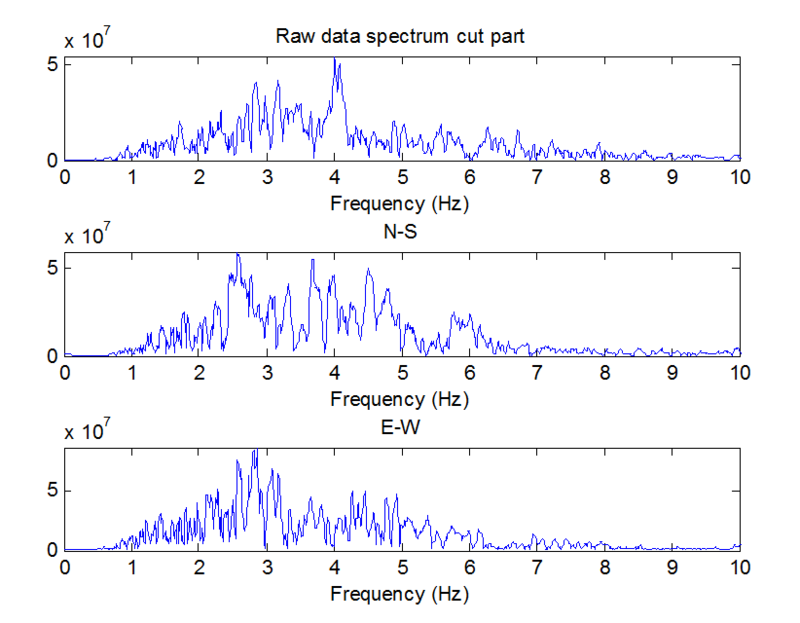 The frequency spectrum of the BB sensor and the spectrum of the wide-band sensors are presented at figures 5 and 6 respectively. 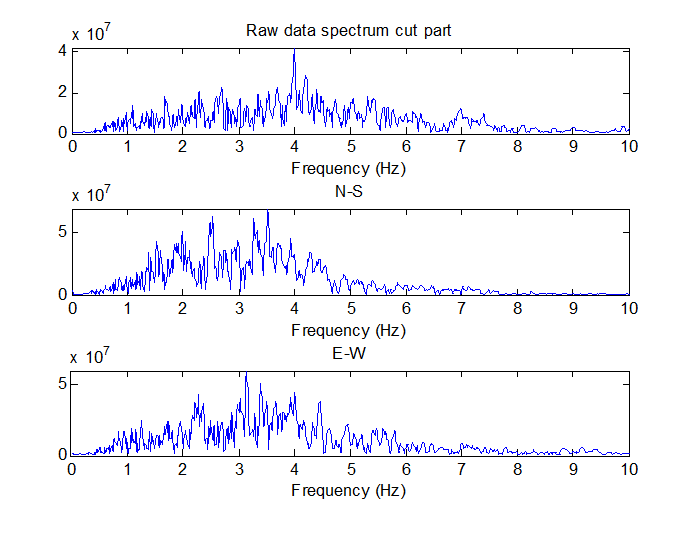 These spectrum plots represent frequencies of the recorded signals of the same earthquake. Clearly, both are equal, therefore enev with the use of wide-band sensor, the recording result is equal. Why not using simple geophones? Commercial geophones with small dimensions have usually natural frequency 4.5Hz or 10Hz. Using these kind of geophones, the lower part of the spectrum of the signal is lost (low frequency), because the geophones cannot respond in the low frequency area (below 4.5 Hz), and its sensitivity falls dramatically. There are also geophones in the market with natural frequency of 2.0Hz or 2.5Hz, but their dimensions do not allow to be used in small boreholes. Their bandwidth is quite enough for magnitude 1 or 2 local events, but not enough to cover low frequency, below 1Hz. The S-100 sensor is based on force-balance principle. Special electronics provide feedback at 4.5Hz geophones, plus additional electronic bandwidth correction and provide a 10sec-98Hz sensor unit. The 4.5Hz geophones are not so sensiitive over tilt. Usually they respond perfectly within 5 – 10 degrees of tilt. 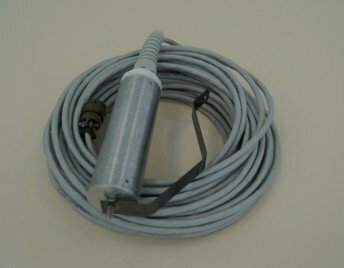 This means that the sensor can be installed into the borehole without any need of special leveling. An elastic packer provided from us, is more than enough to hold the sensor into the borehole. It is leveled according the casing verticality and it is operational, ranging within its characteristics even there is some degrees of tilt at the borehole casing. So, the ideal solution for fast, accurate installation is the wide-band seismometers consisted of 4.5Hz geophones, having small dimensions and low cost, designed according the force-balance principle. Our wide-band sensors meet all the requirements for local micro-earthquake recording in the passive tomography projects and in our new SRi32L digitizer/recorder, the sensor electronics are build-in into the instrument. 3. Why borehole type sensor? Many seismic sensors are surface mount type. For their installation, usually seismic vaults have to be opened, where the noise level is less than the surface. Our instruments are mostly borehole type, so they can be easily installed in a typical depth 20 meters. The noise level at this depth is much less than the surface. The borehole can easily be (in the most of the cases) opened using a drilling machine at low cost, within some working hours. Small diameter boreholes can be opened by hand in rough areas where no vehicles can access. 4. Why high sensitivity sensor? The magnitude (Richter Scale) of the recorded events for the passive seismic tomography exploration, range from –2R to 3R. For the recording of such small events, the sensor must be very sensitive. Our instruments provide high sensitivity such as 1500V/m/sec. 5. Why in-build sensor self test? The operator needs a way to apply a fast signal test to the equipment in order to verify proper operation. Most of the clients are asking for such kind of tests to be performed from the instruments by themselves. The SRi32 recorder provides a build-in signal generator combined with a micro-controller, and injects signal to the sensor. The square wave or sinusoidal signal that injected to the sensor with constant amplitude, forces the masses of the geophones to move. The geophones produce a seismic signal to their output proportional to their movement. The shape of this signal that the user should see is shown at the figures 9 and 10. Once the user connects with the SRi32L unit through the DataMonitor, he can verify the proper operation of the sensor. In parallel, the processor of the digitizer uses this signal to perform auto-calibration function at the system. So, all the seismic stations of the microseismic network can always be calibrated during the recording period. 6. Why high resolution digitiser? The resolution of the digitiser is one of the most important parameters of the seismic instrumentation. 24bits digitizers are mostly used in seismic exploration. The SRi32 unit is based on a 4rd generation 32bit digitizer, with dynamic range 136dB at 250sps, while dynamic range is 142dB at 10sps. 7. Why big capacity storage media? Our standalone seismic stations units are getting powered from a typical 12V battery which may be cycler from seismic crew or charged by a solar panel. The seismic crew usually visits the stations once per month or later for changing battery and retrieving the data. For places that this routine visit is difficult to be done, because that the access of some stations is difficult, the storage media must have enough capacity to store the data for longer period. Using a 2Gb microSD the recording duration for 3ch, 100sps will be up to 26days. Larger capacity Compact Flash Card will be used for larger recording period. The units support up to 64Gbytes flash card. 8. Why very low power consumption? One other important point of the standalone seismic station is the power autonomy. Given that is it powered from a simple 12V lead acid battery, the cycle must be as many days as the seismic crew needs to visit the seismic station. Seismic networks consisted of 50 seismic stations, spread in an area of 1000 – 2000 Sqm2 placed in accessible terrain, usually takes a few weeks to the seismic crew for visiting them. So the power autonomy of each seismic station (recorder + sensor) must be enough for at least one month of operation. Our seismic stations can operate for this time period, powered from a set of double 12V/62Ah lead –acid batteriy.